The Northgate extension is humming along, and construction is on schedule at about 68% completion. Most of the major underground structural work on the stations is complete, and the trackway is nearly ready for electrical and communication systems installation. More good news! The underground Roosevelt Station, designed by Hewitt Architects [HEWITT], has made its way above ground. With 4,661 cubic yards of concrete placed, the roof covering the station is complete. The Hoffman Construction crew are now working on constructing the stations north and south head houses. Neighbors and passersby can see the steel structure peeking over the green sound walls. The Roosevelt station recently marked another milestone – all construction activities at Roosevelt station authorized by the Major Public Project Construction Noise Variance permit (MPPCNV) is finished. This permit was in place to complete the 24-hour a day tunneling work, safely and on schedule. Any remaining station work that must be done outside of normal construction hours requires a temporary noise variance permit. Sound Transit will notify neighbors of any work occurring outside normal construction hours. The MPPCNV will continue to support ongoing night work at the University District station related to the construction of floating slab in the vicinity of the University of Washington campus. What’s next? The tower crane will be dismantled this fall, and some of the green sound walls will be removed in stages and replaced with temporary fencing. Stay tuned for details. Roosevelt Station’s north head house which will house the escalators and elevators and provide ventilation. If you’ve been around the Northgate area, you probably noticed the construction of the Northgate Link Light Rail Station is progressing quickly. 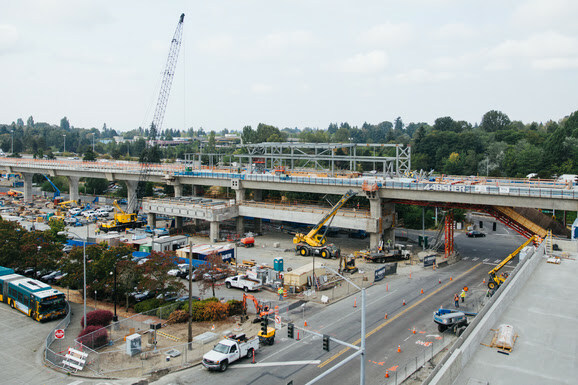 Whether driving through Northgate on I-5, taking a trip to Northgate Mall or heading to your home or workplace in the neighborhood, it’s hard to miss the continuous guideway leading to the future Northgate Station. It is, after all, approximately 2,500 feet long. That’s nearly half a mile! The guideway was constructed in phases, connecting 57 precast concrete girders, which are beams placed on columns that support the guideway structure. It weighs in at a whopping 11.5 million lbs. 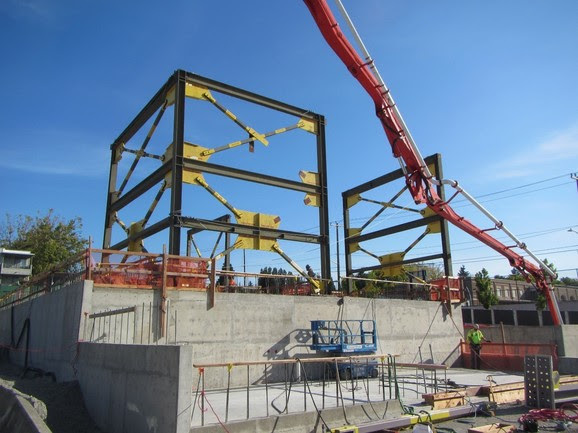 Sound Transit’s contractor, Absher Construction Company, erected the first precast girder in June 2017, and in May 2018 erected the final girder to create a continuous elevated guideway from the Maple Leaf Portal to the future elevated Northgate Station. Rail installation will begin in 2019. See the transformation with the two drone videos highlighting the Northgate station: the first in the early phases of construction in January 2017 and the second in August 2018 showing substantial completion of the elevated guideway. Aerial view of the Northgate Station elevated guideway looking southwest.